The discovery of gravitational waves was the crowning glory of Einstein’s relativity. They might now have provided the first hint of something to scupper it. Our modern understanding of gravity was sketched out in 1915, when Einstein put the finishing touches to his theory of general relativity. Its predecessor, set down by Newton, was a suitable approximation at small scales, but it broke down once you considered objects like stars and planets. In Einstein’s new picture, gravity was the result of massive objects warping the fabric of the universe to create depressions that would pull in anything nearby. Despite being tested again and again over the past century, its predictions have never been found wanting. The one idea we could not scrutinise was that massive bodies approaching each other would squeeze and stretch space-time so dramatically that they would spread ripples out in every direction, like a pebble dropped in a pond. The trouble was that although the events thought to produce these gravitational waves were extremely powerful, the waves themselves would be incredibly gentle. Space-time is stiff; it doesn’t vibrate easily. To stand a chance of seeing gravitational waves that have travelled billions of light years across the cosmos, you need to register wrinkles as small relative to us as we are to the Milky Way. That was the challenge for the scientists who dreamed up the Laser Interferometer Gravitational-Wave Observatory (LIGO) in the late 1960s. Today, it consists of two L-shaped detectors – one in Livingston, Louisiana, the other in Hanford, Washington. Each uses mirrors to bounce synchronised laser beams up and down 4-kilometre-long arms. When a gravitational wave passes through, the arm lengths vary almost imperceptibly – and yet the beams shift measurably out of sync. But achieving this sensitivity was only half the battle. It also took a monumental effort to figure out what the signals coming out of LIGO should look like, and how we could tease them apart from all the other vibrations passing through the detectors. 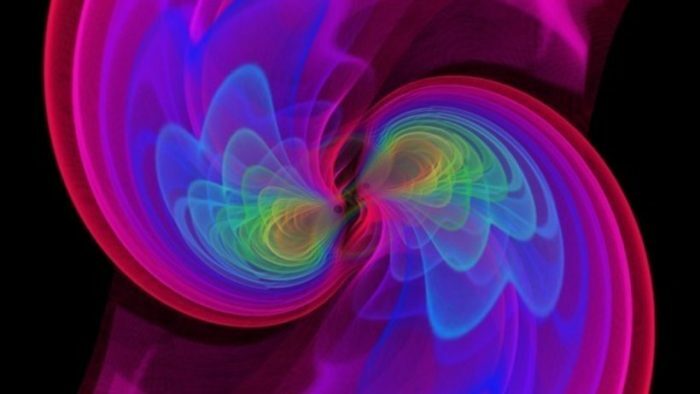 Astonishingly, the 900-strong LIGO Scientific Collaboration pulled it off. They can not only spot a gravitational wave from across the universe, but even decode the information these distortions carry. That’s how we know the masses of the black holes producing these waves, for instance, or that the collisions of ultra-dense neutron stars can seed the cosmos with heavy elements. Even so, the era of gravitational wave astronomy has barely begun. Since LIGO’s second observing run ended in August 2017, the detectors have been receiving upgrades that will significantly improve their sensitivity. They have also been joined by a third detector, Virgo, near Pisa in Italy. The result is that, when the third run starts later this year, we should be picking up gravitational waves at least once a week – and the signals will be clearer than anything so far. That will ramp up the chances of seeing something that doesn’t fit with general relativity. “This is not to denigrate Einstein,” says Richard O’Shaughnessy at the Rochester Institute of Technology, New York. “But there are good reasons to think his theory breaks down on some scales.” The best-known difficulties are two cosmological ingredients thrown in to bring general relativity’s predictions into line with observations: dark matter, which is unseen stuff dreamed up to explain why galaxies seem to rotate faster than their measured mass allows; and dark energy, a mysterious influence pulling the universe apart at an ever-increasing rate. 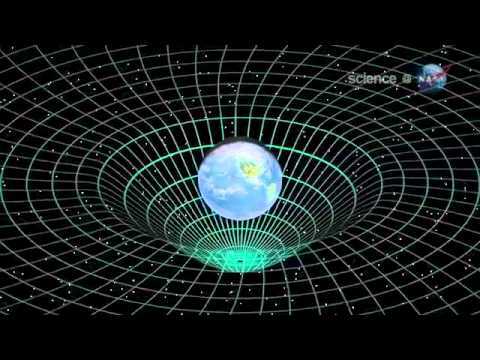 Then there is the fact that general relativity is incompatible with quantum mechanics, the theory of all the fundamental particles and forces – excluding gravity. For the most part, quantum theory reserves its predictions for the world of the very small. But when it comes to black holes, it has something important to say. According to Einstein’s picture, the event horizon of a black hole represents the surface beyond which nothing can escape its pull. For all its importance as a physical border, the horizon itself is insubstantial – that is, there is nothing there. But quantum mechanics suggests there should be a firewall, a ring of high-energy particles that would incinerate anything that passes. In 2016, Afshordi’s team came up with a simple model for what could be at the horizon and figured out how far apart the resulting echoes would be. Then they looked at the publicly available LIGO data. 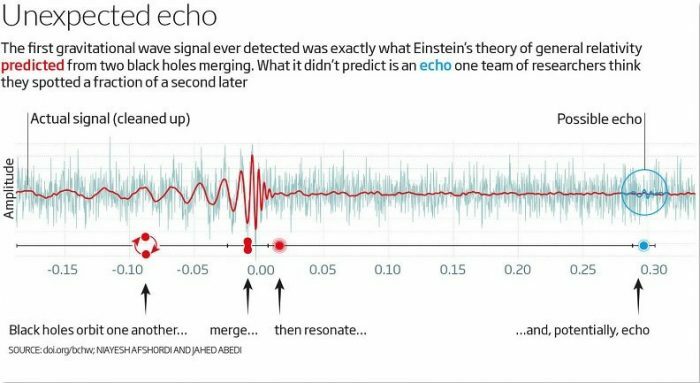 What they found was jaw-dropping: for each of three gravitational wave signals they checked, the black-hole mergers were indeed followed by echoes at precisely the intervals predicted (see “Graph“). Or were they? Afshordi’s calculations suggest that with no firewall, the chances of obtaining a similar signal from random noise would be 1 in 100, falling significantly short of the 1 in 3 million figure required to convince his peers. If Afshordi’s claims do check out, however, it would be the first direct contradiction of general relativity. That would leave two options. Either Einstein’s theory would need to be rewritten to accommodate the firewall, or we would have to abandon the notion of black holes altogether. In that case, general relativity could still survive more or less intact, so long as some pretender emerged to mimic the behaviour of these cosmic beasts (see “When is a black hole not a black hole?“). “Either way, it would be a big revolution,” says Paolo Pani at Sapienza University of Rome. For now, many cosmologists believe that Afshordi’s claims are premature. But that could change as theorists get better at modelling the signals they expect firewalls to produce, and as the data analysis improves. Still, others prefer to chase less speculative prospects. 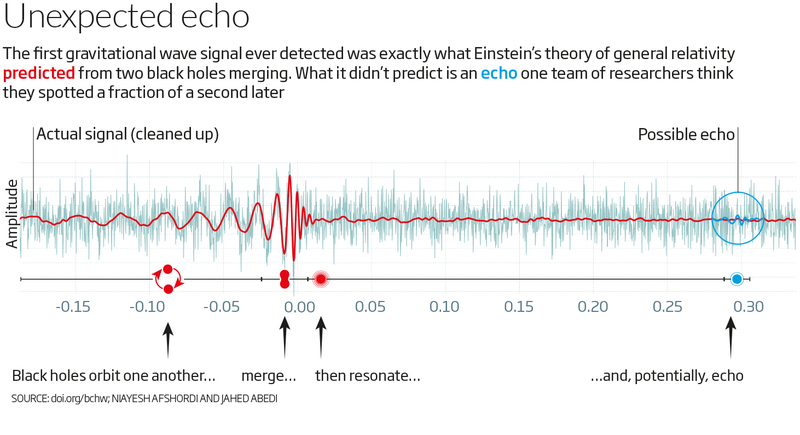 Rather than seeking exotic phenomena with dramatic consequences for Einstein’s theory, they are tweaking the underlying equations to see what they imply for LIGO observations. In some cases, these modifications could solve cosmological conundrums. In others, they might smooth the way to a viable quantum theory of gravity. Either way, says Yunes, “with modified theories of gravity, you’re building on solid foundations”. You don’t have to make up the shape of signals based on ill-defined ideas of what to look for. Instead, you add fresh ingredients to Einstein’s equations and solve them to build a full prediction of what you expect to see in these extreme conditions. Then you test it against the data. The trick is to find weak spots in those foundations. General relativity has several core principles and from those arise specific predictions: that gravitational waves will travel at the speed of light, for instance, or that they preferentially corkscrew anticlockwise along their direction of travel. “You break one of these principles and then you ask what would be the consequences,” says Yunes. The LIGO detections so far have already killed off several modified theories of gravity that purported to explain dark matter or dark energy, including some that predicted space-time ripples would travel at below the speed of light. But there are plenty more where they came from. Yunes, for his part, is partial to a theory that conjures an extra field into existence. It couples to gravity in such a way that it would explain why matter was not annihilated by antimatter in the first moments of universe – and thus why the universe isn’t filled with radiation alone. Such modifications imply that gravitational waves would be more likely to corkscrew clockwise rather than anticlockwise. That would, in turn, mean we would observe black holes spiralling into one another much faster and more violently than relativity predicts. Emanuele Berti at the University of Mississippi is among those exploring alternative theories of gravity. “We all have our own favourites,” he says. “But the broader point is that these theories are mathematically tractable.” In other words, we know how black holes should behave if these theories are correct, so we can accurately predict how the gravitational waves they produce should look. When is a Black Hole Not a Black Hole? One of the hallmarks of black holes is that you can’t see them. Their density is so great that nothing – not even light – can outrun their pull. But if you see gas or dust or stars drawn to an invisible gravitational heavyweight, chances are you have spotted a black hole. Or have you? Some cosmologists propose that what we have long assumed to be black holes might be something else entirely: exotic hypothetical entities known as boson stars. Unlike most matter, which is made of particles called fermions, these objects would be made of bosons – which are capable of packing much more densely and acting in perfect harmony. In theory, if some as yet unknown bosons had the right properties, these blobs could get so massive as to distort space-time in much the same way we expect from a black hole, only without collapsing to become one. Pani is among those working to figure out what observational signatures would distinguish pairs of boson stars from black holes. “We would expect boson stars to vibrate differently,” he says. Even if we do find them, however, boson stars are unlikely to consign black holes to the dustbin of cosmology. Boson stars are less compact, says Pani, so it is pretty much impossible for them to account for all our observations.